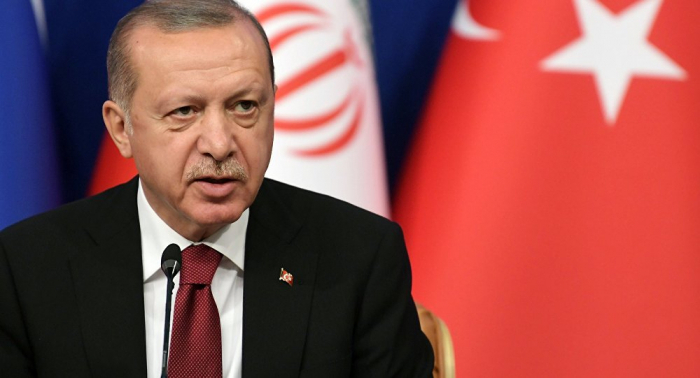 Earlier, the Turkish president warned that Ankara planned to "resolve" the "Syrian issue on the field," rather than the negotiating table, after the March 31 elections. Turkish President Recep Tayyip Erdogan said he intends to discuss the possibility of a new Turkish military operation in Syria with Russian President Vladimir Putin during his visit to Moscow on Monday. "Our preparations at the border are completed. Everything is ready for the operation. We can start it at any moment. I will discuss this and other issues during the visit to Moscow," Erdogan said, speaking to reporters before getting on his plane to fly to the Russian capital. Erdogan's comments follow on his earlier remarks about Turkish preparedness to launch an 'anti-terrorist' operation east of the Euphrates river, and in Syria's Manbij, against the US-backed Syrian Kurdish self-defence forces, whom Ankara classifies as a terrorist group. Erdogan previously said that the military had decided to postpone the operation following a telephone conversation with US President Donald Trump in mid-December, after which Trump made the decision to withdraw US troops from Syria. Late last month, Erdogan said Ankara intends to see "the resolution of the Syrian issue on the field, not at the table, if possible." The president's comments were followed up by an inspection of Turkish forces stationed near the Syrian border in Turkey's southeastern province of Sanliurfa by the defence minister and the chief of general staff. Ankara launched a military operation into northern Syria in January 2018, with the operation, codenamed 'Olive Branch', targeting Syrian Kurdish forces in the northwestern Syrian city of Afrin. Turkey considers the US-backed Kurdish People's Protection Units (YPG) to be an affiliate of the Turkey-based Kurdistan Workers' Party (PKK), which Ankara considers to be a terrorist organisation. The Syrian government has condemned both US and Turkish interference in the country's internal affairs, and has urged both countries to refrain from operations on Syrian sovereign territory. Russia, meanwhile, has urged any talks on a possible anti-terrorist buffer zone along the Syrian-Turkish border to account for both countries' interests. In addition to Syria, Putin and Erdogan will discuss issues of regional cooperation, economic cooperation, visa-free travel, and other bilateral, regional and global issues.